Here is one of two identical luxury rental villas with pools, private gardens and barbeque areas. These villas are just 5 minutes walk from the botanical gardens, and are set on a sea view hillside. The botanical gardens is one of Bulgaria’s top tourist attractions on the black sea coast, so there are loads of restaurants and supermarkets all within the vicinity of the lovely rental villa, and yet the villa zone itself is very peaceful. These three bed roomed rental villas, both can sleep upto 9 people with the top floor consisting of double bedroom, bathroom with shower and an extremely large roof terrace, the first floor has another double bedroom along with a twin bedroom, and a bathroom with corner bath. On the ground floor there is another bathroom with shower for added convenience throughout your stay. Also on the ground floor is a fully equipped kitchen, dinning area, a large living room with sofas and cable TV. The living room has one double and one single sofa bed. Hot and cold air-conditioning is provided for the entire ground floor and the master bedroom. The kitchen is fully equipped with a washer / dryer, microwave, cooker and all other appliances. The swimming pool and barbecue areas provide the perfect setting for a perfect day or evening, but, you might also like to enjoy some of Bulgaria’s best beaches locally in Albena or Balchik – both are just 10 minutes away. Balchik is a town and seaside resort situated terrace-like on a small bay up the coast from Albena. Apart from its palace and botanical gardens, the town attracts tourists with its ancient atmosphere that has been preserved for centuries. After the Balkan war in 1913 Balchik was included in the territories of Romania. It became a luxurious resort and Queen Maria built a palace and botanical gardens, a chapel and a villa for the Romanian aristocracy. After 1940 Balchik was again included in Bulgarian territory. The Palace Complex, built between 1924-1936 consists of a central palace with high tower, numerous buildings in a modern style at the time, a terraced park, paths, stone summer houses propped on marvelous columns facing the sea, a throne under an old tree where Queen Maria loved to sit and watch the sun set, a small chapel where her heart is preserved. The botanical gardens have more than 3000 rare and exotic species of plants. 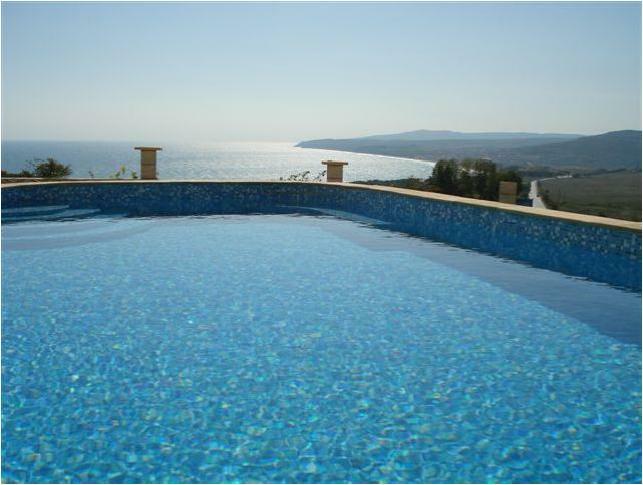 The Great location of Balchik is only 30 mins from Varna international airport. The near by facilities include a supermarket, restaurants and other stores. Balchik and its lovely bay is a mix of history and modern and is only a few miles up the road from Albena. Albena with its giant beach is easy to get to too, and is the place for the younger fun loving types. Or visit Varna City for sophisticated night life and designer shopping. All types of sea activities can be done, as coastline has modern resorts. Countryside is beautiful, with National forest parks.